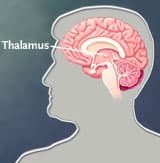 Thalamotomy is a surgery for Essential Tremor that destroys a small part of a structure in the brain called the thalamus. Surgeons typically perform this procedure on only one side of the brain because surgery on both sides of the brain increases the risk for potential complications. The procedure provides relief to the opposite side of the body. So, if the right side of the brain is operated on, the person will experience tremor relief on the left side of his body. Approximately 80% of patients who have this procedure experience relief from their tremors. The major disadvantage of thalamotomy is the permanent destruction of this area of the brain, which may limit future treatment options, and thalamotomy should only be performed under rare circumstances. Deep brain stimulation, described below, is safer and more effective. Also called "thalamic stimulation," deep brain stimulation is a way to inactivate the thalamus without destroying a part of the brain. The risks are, therefore, much less than with thalamotomy. Rather than destroying brain tissue, deep brain stimulation achieves the same effects using small electrical shocks. The electrode for deep brain stimulation is left in the brain and connected by a wire to a pacemaker-like device implanted under the skin of the chest. The pacemaker-like device generates the tiny electrical impulses that aren't painful to the patient. These shocks alter electrical "messages" going through the thalamus. Deep brain stimulation provides moderate relief for approximately 90% of patients. It may be more effective in controlling tremors than thalamotomy. The presence of a foreign object in the body, increasing the risk of infection. A battery in the device that must be replaced every three to five years. Uncomfortable sensations that may occur during stimulation. As with any surgery, there are potential risks associated with these forms of treatment for essential tremor. Talk with your doctor about these risks and any other potential complications.